New York City experiences are unforgettable. Your memories are as vibrant as the historic and youthful energy that pulsates off of your skin as you walk the streets, the tall brick buildings, stately windows, the stoops of the brownstones and the modern interiors that don’t trigger claustrophobia at all. 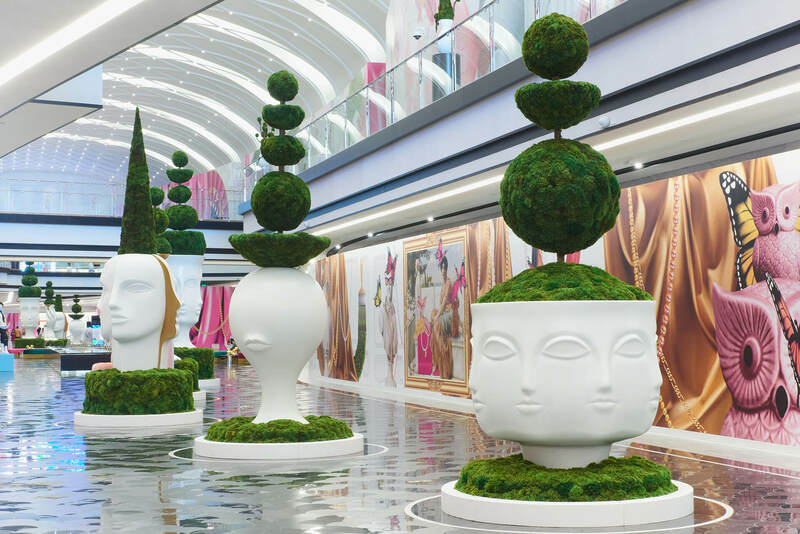 In New York City, indoor moss murals are wildly popular, taking the queue from vertical gardens that started appearing a decade ago and made such a difference in city life around the world. The hip co-working space NoMad in NYC with white painted industrial ceiling, tubes, and neutral colors, has most recently added a moss mural wall of no less than 120 feet in length and across four partitions. Cosmic, geographic symbols, our enigmatic pisces eye and lines radiate to give it a feel that you are in a different star system and add dimension and texture to the space. 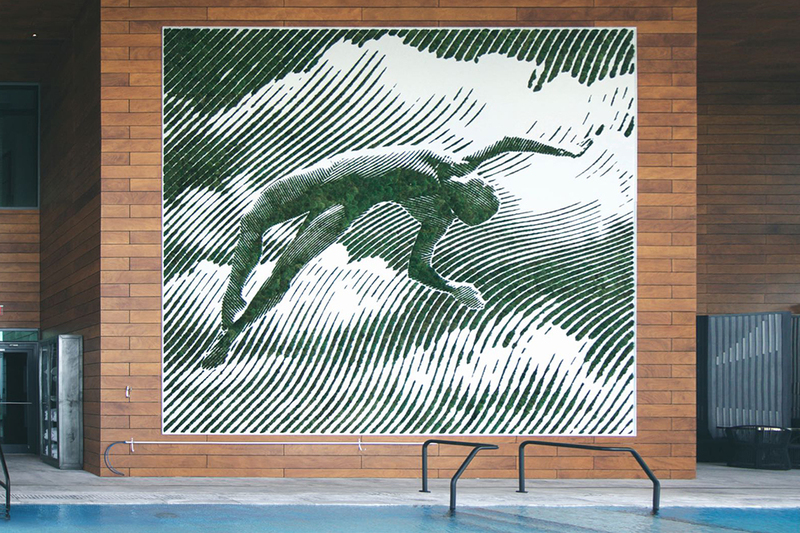 > > To speak with someone regarding a moss mural for your home, hotel, business or office, contact Plant the Future. Our portfolio includes Miami, New York City, Australia, Savannah, Chicago, and more. Another Plant the Future project was with the Meliã International Hotel, that are known for prime locations; resorts where guests can delight on the best beaches, trendiest cities and in luxurious surroundings. 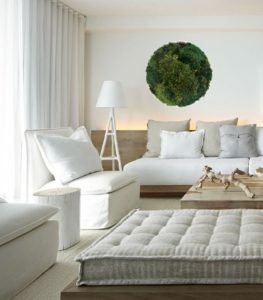 The brand is known for being a vanguard in the guest experience, ensuring that their properties are always look slightly in the future, with a forever fresh and optimistic feel for the grandeur of life. A high ceiling with windows almost feel listless, but for the energetic “LEAP” mural by Paloma Teppa + 2ALAS. well-maintained and a favorite with the guests. Plant The Future on Vimeo. How are Moss Murals Made? Whatever the image, it can be captured through photography or created on a desktop. A skilled artist can interpret the images into lines and patterns that not only capture the silhouette, but the expression that evokes an emotional reaction in the viewer. This digitized pattern in outlines is plotted and either cut into wood, acrylic, glass or impressed into cement or whatever material is appropriate for the climate, conditions and budget. Glue, such as E6000 or other, fills in the cracks and the moss is patted down into the glue. Moss is very resilient and will thrive virtually anywhere it is given opportunity. Some moss art and décor is readily available and can be bought “off the shelf,” without the need for commissioning an artistic piece. When space is scarce, hanging moss spheres in different sizes in angles add a modern touch as well as some green healing power. No-maintenance moss makes it the most used live plant for murals, jewelry, gardens, décor and more. > > See our collection of ready-made moss art. Why Use Moss Instead of Other Live Plants? Moss doesn’t need much in the way of maintenance, and yet it remains bright, calming, refreshing green; reaching a part of humans that we all desire to connect regardless if we are fully aware of it. Moss does not even need any soil. Clean, low-key and low-profile, moss never overgrows and takes over space with roots or leaves. Try to keep the temperature between 60 – 85 degrees F. Direct sun may parch your moss, since it loves darker corners and is excellently suitable for indoor areas that need a plant to infect the inhabitants with its generous love. Start the creative process to create an artistic moss mural that will liven your space today. Contact us at Plant the Future.